Whether you are in the recording studio, at a performing arts center, or in a multipurpose room, the best performance demands the best equipment. The Duet2 LED Music Light enhances one of our most popular models with features that benefit orchestras, bands, and any performers who play under controlled lighting. Two separate flexible goosenecks are outfitted with two LED's each, providing up to four possible light levels. Offering twice the intensity of the Duet, the Duet2 brightens two to three pages of sheet music. Tap-on power buttons make it easier for musicians to prep quickly for performances. 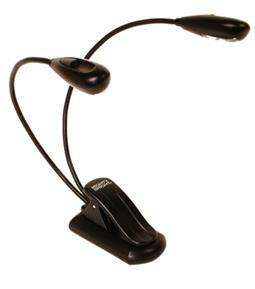 This professional grade music stand light is ideal for those who leave nothing to chance; use the optional AC adapter to keep the music coming, encore after encore.